The sun always seems to hit one side of the boat more than the other while anchored. Also may act as a wind scoop? Easy on & easy off. One person installation. No d@mn snaps! 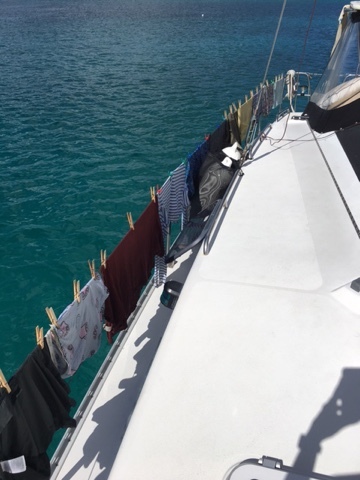 One day, after hanging out laundry, I realized the laundry hanging on the life lines, had the added bonus of shading the bright sun from coming in our two large side hatches. Hmmmm. We've been on a lot of catamarans that have some kind of cockpit shade that runs from the hard bimini to the lifelines. A friend explained their set-up could attach to the lifelines or the toe rail, depending on need. They also only had ONE since the sun is usually only on one side! 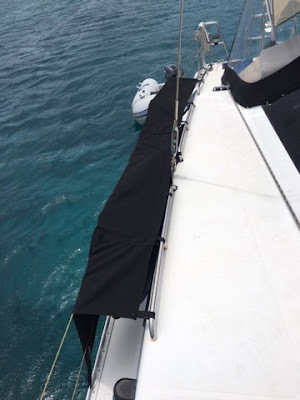 This set-up is difficult on our boat since it would block the main walkway. 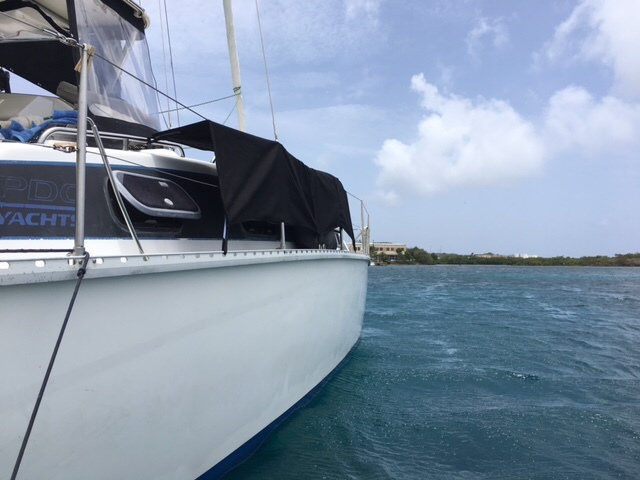 However, after sitting and studying a neighbor catamaran's set-up (two solar panels as their "bimini roof" with side sunshades attached from the solar panels to the life lines), I walked down below. Dang! 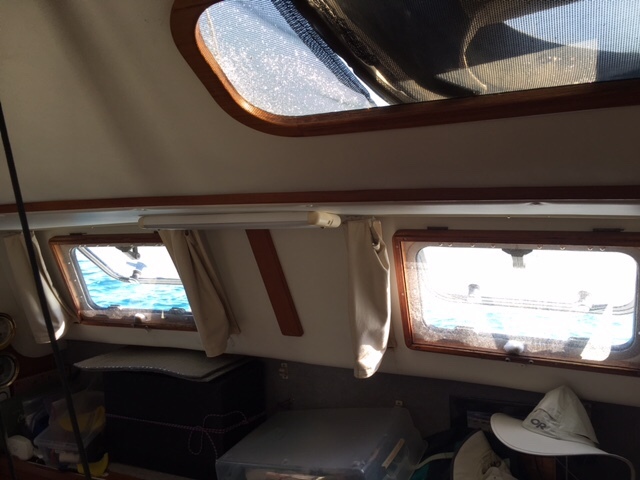 The sun is really shining on the starboard side of the boat! Some days, I even close those hatches and put the insulation in. Then lightbulb! 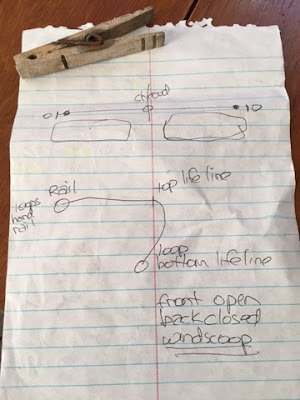 A baby sunshade from hand rail to the life lines! Apparently I was talking out loud, because The Captain said, "Huh?" 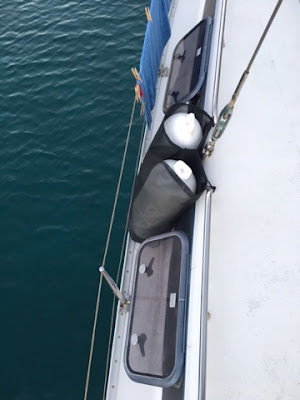 and followed me as I ran back out on deck. At first he was puzzled, then he started to picture it. "It could also be a wind scoop". YES! A minor error left the shade longer than originally intended. It "almost" reaches the side head hatch. Still get indirect sunlight & airflow. May make a second one to cover the SUP (protects from UV) instead of using the dinghy cover. Con: I have to hang the laundry on the other side or move the sunshade. Share your feedback and improvement ideas. 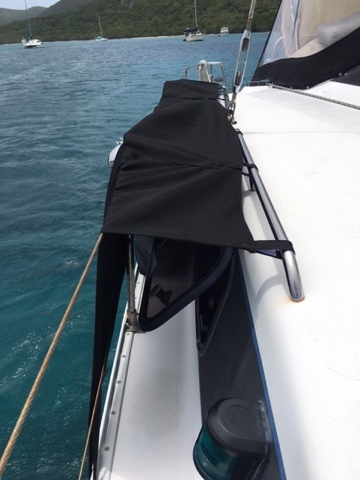 Show us your sunshades!